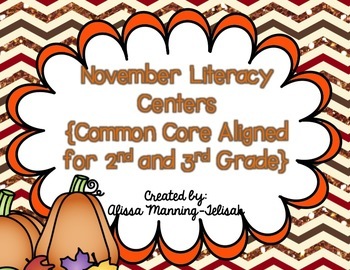 These six November literacy centers will be a great addition to any center rotation! Centers are aligned to 2nd and 3rd grade Common Core State Standards. These are great for 3rd graders to review previous year's skills! All six centers also include recording sheets. These are very easy to use and provides great engagement for students! 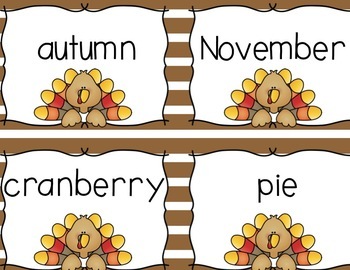 *Thanksgiving Dinner ABC Order: Put the words into alphabetical order. 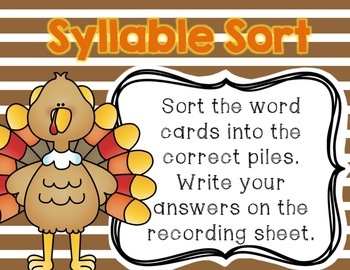 *Syllable Sort: Sort words into piles corresponding to 1, 2, or 3 syllables. *Plural Noun Match-Up: Match the singular nouns to the plural nouns. *Related Verb and Adjective Sort: Sort the related verbs and adjectives into groups. *Writing Prompts: Included are 10 writing prompts that have the kids writing opinion, narrative, and informative pieces. (**NOTE: These 10 prompts are also included in my November Writing Prompts pack in my TpT store). 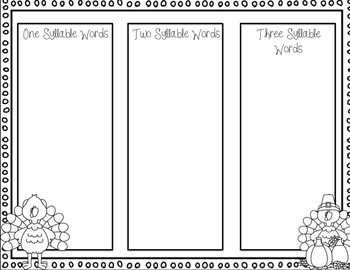 *Making Words: Students create as many words as they can, using the word THANKFUL. L.2.1b and L.3.1b Form and use frequently occurring irregular plural nouns (e.g., feet, children, teeth, mice, fish). L.2.4e and L.3.4d Use glossaries and beginning dictionaries, both print and digital, to determine or clarify the meaning of words and phrases. L2.2d and L.3.2f Use spelling patterns and generalizations in writing words. L.3.1a Explain the function of nouns, pronouns, verbs, adjectives and adverbs in general and their functions in particular sentences. W.2.1 and W.3.1 Write opinion pieces on topics or texts, supporting a point of view with reasons. W.2.2 and W.3.2 Write informative/explanatory texts to examine a topic and convey ideas and information clearly. W.2.3 and W.3.3 Write narratives to develop real or imagined experiences or events using effective technique, descriptive details, and clear event sequences. RF.2.3 and RF.3.3 Know and apply grade-level phonics and word analysis skills in decoding words. L.2.5b and L.3.5c Distinguish shades of meaning among closely related verbs (e.g., toss, throw, hurl) and closely related adjectives (e.g., thin, slender, skinny, scrawny).